Action from a 4-4 between Posh and Southampton in a League One fixture in 2011. Southampton Under 21 will provide Premier League opposition for Peterborough United in the 2017-18 Checkatrade Trophy. The Saints were today (July 12) drawn in a group alongside Posh, Cambridge United and Northampton Town. Posh last played Southampton in a competitive game in the Championship in 2012 when the visitors won 3-1 at London Road. Posh will open their 2017-18 Checkatrade Trophy campaign with a home game against Southampton on week commencing August 28. 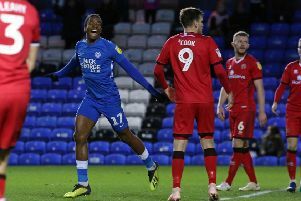 For the second season running Posh will play two of their three group games at the ABAX Stadium. Cobblers visit Posh in the week commencing October 2 before Grant McCann’s men travel to the Cambs Glass Abbey Stadium, Cambridge on week commencing November 6. Posh have not played competitively at Cambridge since the 2001-02 season when the teams fought out a 0-0 draw in a League Two game.